This ignition switch replaces the outdated rotary key-switch. 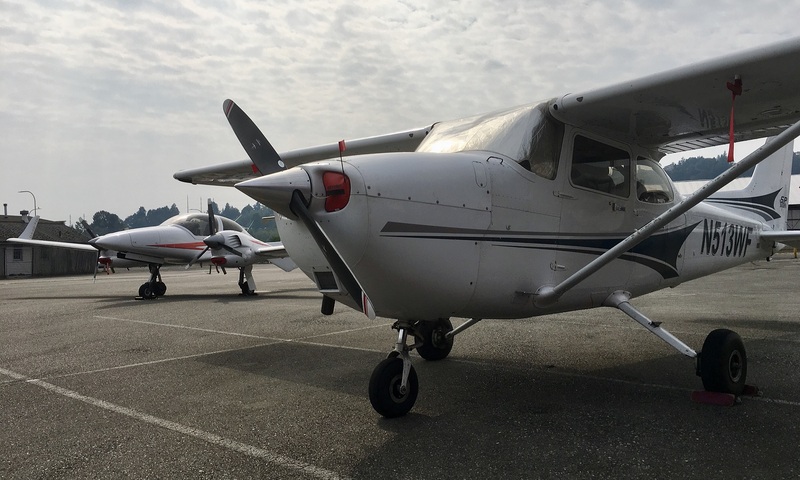 Just make sure you have the keys with you in the cockpit after pre-flight so that they’re not inside any of the door locks as you taxi out for a flight. Push the red START button to engage the starter. 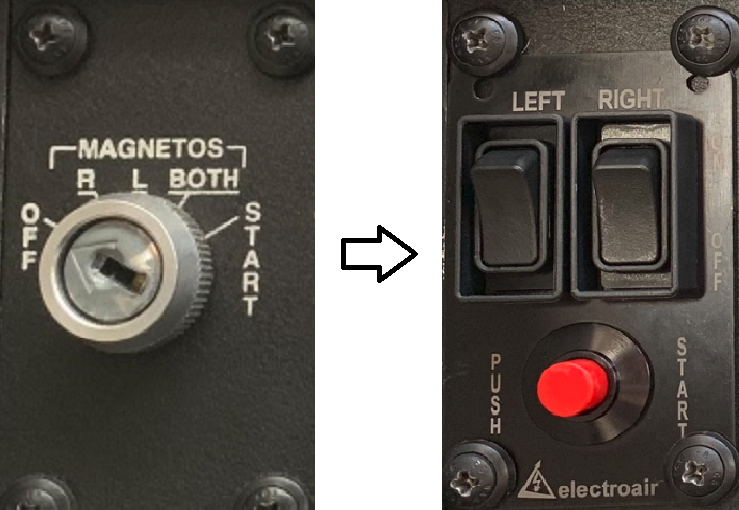 During runup, you simply turn off the left mag and run the engine only on the right mag for a few seconds to check on the RPM drop, turn left back on and do the same with the right mag. When you shut down the engine, instead of turning the key to the left and removing it you need to turn off the two mag switches (don’t press the red START button). The mag switches should never be left on before or after flight. The MAGS OFF sign provided by Galvin should be displayed in the window when the aircraft is parked and the mags are indeed verified off. An AFM supplement has been placed in the plane (see plastic box in baggage compartment) and can also be consulted online if there are any questions. Down the road the magneto-only ignition system may be upgraded to an electronic one (EIS) with basically the same switch panel, but that’s not decided yet. The newly installed zero-time factory-rebuilt engine is doing well and can now be used normally. The EGT issues are still not fully sorted out, at the moment the #3 cylinder probe is not reporting – that is a minor issue, but it will be looked into with the next service opportunity. The most important point first: Normally you shouldn’t press the G5 On/Off switches at all – neither for startup, nor for shutdown (when a 3 second shortcut is offered – the rechargeable G5 backup batteries last four hours each, so the extra 42 seconds really won’t make any difference). The lower G5 (HSI) has occasionally been observed to not boot upon turning on the master switch. If that happens to you, the simple fix is to press and hold the affected G5’s On/Off switch for about ten seconds – just don’t let go – until it boots up. That’s the only only situation where the On/Off button of the G5 units should be pressed. A recommended fix by Garmin has been applied on Jan 3 to hopefully keep that boot-up issue from occurring in the first place. If all above three methods should fail to disengage the AP or a runaway trim then by all means pull the AP circuit breaker (that would be a very rare case though), and hand-fly the plane. Cessna uses a white ring around the AP circuit breaker, but we could only get a yellow one – which is close enough (also note that we deviated from Cessna’s standard of inexplicably marking the fuel pump switch in the same color as the lights – white – whereas we chose blue, just like the color of the 100LL the fuel pump moves before engine startup). 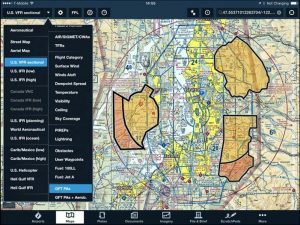 To use the AP please familiarize yourself with the AFMS and this guide published by Garmin – and of course follow the advice of your CFI.